Dr. Bahman Sotoodian is a double board-certified dermatologist in USA & Canada. He graduated as the top 1% student at Simon Fraser University in Vancouver, Canada from the challenging electronic engineering program. He subsequently attained his MD from the prestigious University of British Columbia, Vancouver. As one of only 25 medical students across Canada, he was privileged to match to a rigorous five-year dermatology program at the University of Alberta, Edmonton. As an avid scholar, Dr. Sotoodian never stopped satisfying his sense of curiosity and interest in advancing the field of dermatology. 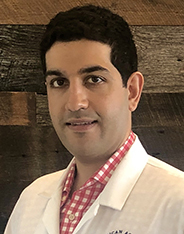 During his residency, Dr. Sotoodian participated in numerous research activities and published more than 14 manuscripts in various reputable national & international dermatology journals. He also was provided significant opportunities to discuss his research & clinical achievements during oral presentations in more than 15 conferences across Canada & the United States. His achievements earned him 30 diverse scholarships during his trainings. Dr. Sotoodian is currently serving a 2 year term as one of the board of directors of the American Society for Laser Medicine and Surgery (ASLMS), he is also an active member of American Academy of Dermatology (AAD), American Society for Dermatologic Surgeons (ASDS), Women’s Dermatologic Society (WDS) & the only resident who has ever served as the member of Canadian Dermatology Association (CDA) ethics committee. Besides his keen interest in complex connective tissue disorder & vasculitis, he has achieved tremendous experience in the world of Cosmetic Dermatology by participating in various hands-on courses, receiving personal injection & laser training. The most significant tipping point in his quest to master the art of cosmetic dermatology has been to work alongside Dr. Mark Taylor at Gateway Aesthetic Institute & Laser Center. Dr. Sotoodian has a keen interest in diverse cosmetic procedures, especially full-face resurfacing, acne treatments, blepharoplasty, liposuction, as well as vaginal rejuvenation. Dr. Sotoodian is married to Dr. Shazneen Hushmendy, a talented Obstetrics & Gynecologists and they enjoy exploring new cultures and cuisines during their various adventures around the globe. Dr. Sotoodian is also significantly involved in his faith, Zoroastrianism, and believes that through “Good Thoughts, Good Words and Good Deeds,” prosperity and peace is attainable in anyone’s life.